Senator Collins' support of the Republicans' controversial tax reform bill has tarnished her reputation with liberals and centrists, experts told me for this week's story in the Maine Sunday Telegram, but it shouldn't have come as a surprise. I talked to political scientists in Maine and across the country about how here vote matched with her long expressed principles about the importance of the legislative process, protecting health care, and the deficit. Fairly well, was the answer, in that she's always been for cutting taxes and, within that context, saw her role as mitigating some of the side effects of the legislation. Read on to see why they - and her spokesperson - say so. None doubted, however, that this vote may well represent a parting of the ways between non-Republicans and a senator who was last reelected in a very purple state with 67 percent of the vote. In February I did a detailed story on Collins' new, uncomfortable role as a potential check on the Trump administration, and in April, I had this analysis of Collins' voting pattern over her tenure as Senator. Since then she briefly became a hero to at least non-Republicans in Maine when she opposed her party's uncertain repeal of the Affordable Care Act, but appears to have lost those supporters now. Late yesterday evening, a federal judge riled in favor of Maine's member of President Trump's voter fraud commission, who had sought an injunction to force the body to provide him access to information, schedules, and working documents to allow him to fully participate in its proceedings. The judge didn't parse words. Details in the story, which appears in tomorrow morning's Maine Sunday Telegram. Secretary of State Matthew Dunlap, one of four Democrats on the 11-member body, sued the body in federal court after its staff for weeks ignored his request for these documents, alleging violations of the Federal Advisory Commissions Act, which requires commissioners receive communications equally. Dunlap, initially open minded about the commission, has slowly become one its most vehement internal critic, denouncing its Vice Chair's erroneous accusations about fraud in New Hampshire and the lack of information flow. For additional coverage of this ongoing story, start here, but don't miss this story and this one. Can a fallen New Hampshire mill town become the Silicon Valley of human organ manufacturing? Over at POLITICO, I have the story of how inventor Dean Kamen is leading a $300 million push to resolve bottlenecks in the mass production of genetically-customized human tissues and organs and, he hopes, turn Manchester, New Hampshire into the "Silicon Valley of regenerative medicine." It's a remarkable vision, and one backed by an $80 million Pentagon grant that's ramping up research-and-development of the processes, manufacturing technology, 3D-printers, and process controls that would allow humans to print and grow their own replacement organs rather than wait on a transplant list. And Kamen has industry giants like Rockwell Automation on board, not to mention the entire political class of his tiny adopted state. It's also taking place within the Millyard, a once-all-but-abandoned 19th century brick industrial complex that was, back in its heyday, the largest textile manufacturing facility on the planet, and a physical expression of the post-Puritan dream of what a republican industrial utopia might look like, a topic I delved into in detail for this POLITICO piece a couple of years back. When I met with him, Kamen highlighted the remarkable similarities between what Manchester is trying to do and what I wrote about Winston-Salem, North Carolina having accomplished. I'd have to agree, the parallels are pretty remarkable, right down to the focus on growing of human organs. On Tuesday, Dec. 19, I'll be speaking on "Journalism in the Age of Trump" at the Scarborough Public Library here in Maine. It's rescheduled from last week, when frozen rain compelled a last minute postponement. The event is presented by the Camden Conference, which kicks of its 31st annual meeting in February on the theme of "World Disorder and America's Future." My talk kicks off at 6:30 pm and is free and open to the public. Details herein. My next scheduled speaking event is at the the 2018 Forum of the Council for Christian Colleges and Universities in Dallas, Texas, where I'll be presenting the American Nations paradigm and some of the key themes of American Character: A History of the Epic Struggle Between Individual Liberty and the Common Good. Recently Phil Johnson, host of the Under the Crossbones podcast, contacted me and noted that we've next year will mark the 300th anniversary of Blackbeard's death in the Battle of Ocracoke Island. How time flies! 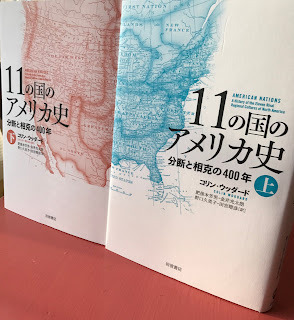 I talked to Johnson about Blackbeard, the Golden Age pirates, and how I researched my history of them, The Republic of Pirates: Being the True and Surprising Story of the Caribbean Pirates and the Man Who Brought Them Down. Our conversation has just posed online for your pirate listening pleasure. Thanks to Phil for his interest and hope you all enjoy. The state has a plan to mitigate Maine's most infamous summer traffic bottleneck, the one in the historic village of Wiscasset, where US Route 1 passes down Main Street to and from the only bridge for miles that crosses the Sheepscot River, linking the Boothbay and Bristol peninsulas with points South. 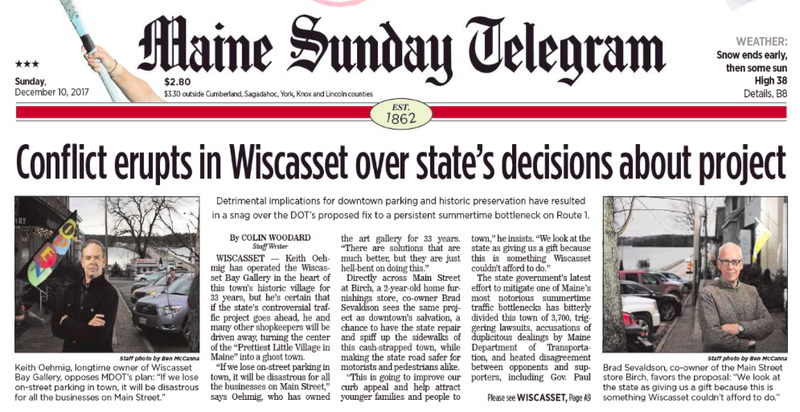 As you can read in my story in this week's Maine Sunday Telegram, the town is now opposed to the project and is suing the Maine Department of Transportation to stop it, alleging that it is violating town ordinances and state law and that it changed the project after receiving approval. Among other things, the DOT suddenly decided not to use federal funds, which were to pay for 80 percent of the project's $5 million price tag, thereby avoiding historic preservation requirements. And Gov. 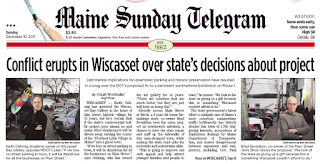 Paul LePage threw fuel on the fire with blustery notes to constituents telling them he's had enough of Wiscasset's obstruction and wishes he could put a viaduct right through the center of the village, carrying traffic up and over to the bridge as it does in Bath. And local businesses fear it will destroy the village. But others support the project, including the select boards of neighboring towns and some business people, who believe the project will revitalize Main Street, not destroy it. Next Tuesday I'll be speaking on "Journalism in the Age of Trump" at the Scarborough Public Library here in Maine.